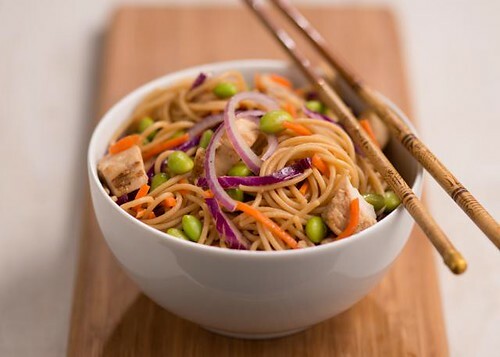 Sesame Asian Noodle Chicken Salad; a new USDA recipe just posted! USDA’s Food, Nutrition and Consumer Services just released 50 new, mouth-watering recipes for schools chefs on our What’s Cooking? USDA Mixing Bowl website. Some are existing USDA recipes that we’ve updated, while others are brand new recipes that students will love. These tasty, kid-approved recipes are tailored for large quantity food service operations in 25, 50, or 100 portions. And each recipe includes a nutritional breakdown as well as crediting information on how the recipe contributes toward updated meal pattern requirements for the National School Lunch Program and other USDA child nutrition programs. The 50 recipes include main dishes and side dishes featuring more nutrient-rich ingredients such as whole grains, dark green and red/orange vegetables, and beans/legumes than ever before. And an additional 150 recipes are being developed and will be posted throughout the next year! These recipes will provide a ready-to-go resource for school nutrition professionals looking for delicious, nutrient-rich dishes that will make it easy to meet meal pattern requirements and satisfy hungry kids. Another new resource on our What’s Cooking? website includes 16 step-by-step cooking videos that make it easy for home cooks to serve healthy meals on a budget. Featuring a variety of nutritious USDA recipes in household-sized portions, these videos feature Chef Amy Riolo demonstrating instructions and variations of delicious dishes like carne adobada, pumpkin soup, and red beans and rice. The recipes are a great complement to the healthy foods kids eat at school and are sure to please parents. So whether you’re a school nutrition professional, parent, or just someone looking to add more nutrition to your daily diet, USDA’s What’s Cooking? USDA Mixing Bowl website has got the tools for you!